It is thought that green peas originated in south west Asia and spread though out Europe. Green peas contain phytonutrients which have powerful antioxidants and anti-inflammatory properties. Green peas are an excellent source of folic acid. Folic acid is a b-vitamin complex that is required for DNA synthesis (Green peas nutrition facts). The folic acid that is found in green peas in combination with vitamin B6 helps to lower homocysteine levels in the blood. High levels of homocysteine raise the level of bad cholesterol. High levels also oxidize cholesterol which leads to the development of plaque formation in the arteries. When plaque builds up in the arteries, heart attacks and strokes can occur. Homocysteine also cause bones to weaken which leads to osteoporosis (Mukherjee). Vitamin K is found in very high levels in green peas and is instrumental in bone health. Vitamin K has been found to increase bone mass by promoting ostroptrophic activity in the bone (Green pea nutrition facts). 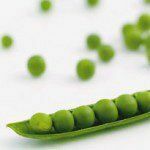 Green peas are also high in vitamin A. Vitamin A is essential for maintaining healthy mucus membranes and skin. Eye sight is also influences by vitamin A levels. Along with vitamin A, green peas are high in carotenes, lutein and zeaxanthin which help to protect against lung and oral cavity cancers (green peas nutrient facts). There are no known side effects of green peas (Carleon). Carleon, Jill. Dried Green Pea Nutrients. Livestrong, 23/01/2001. Web. 28 Jun 2012. Green peas nutrition facts. N.p., 2009. Web. 28 Jun 2012. Mukherjee, Nita. Composition and Health Benefits of Green Peas. Nutrition, 23/07/2009. Web. 28 Jun 2012.